Dr. Q Dental provides several cosmetic dental procedures for patients in Monrovia, Arcadia, and the surrounding areas. The Solea laser is revolutionizing dentistry because of it’s impeccable ability to provide less trauma to teeth, as well as getting patients in and out of the office and on with their day. Dr. Q is a Level II-certified Monrovia Invisalign dentist. Patients who choose our practice are receiving dental guidance from a knowledgeable and well-trained source. Professional and Caring Dentist in Monrovia. Dr. Q stresses the importance of delivering high-quality dental care to patients in the Monrovia area. She treats all her patients as individuals, acknowledging their concerns and reassuring them throughout their treatment plan. Dentistry with an emphasis on the Monrovia community. Drawing from standards of dental excellence in her education and more than a decade as a practicing dentist, Dr. Q gives back to the Monrovia community by donating some of her free time as an emergency dentist at Foothill Community Center in Monrovia. In both her practice and volunteer activities, Dr. Q invests the time necessary to establish rapport with patients and make them more comfortable before, during, and after procedures. Dr. Charlyn Quiec, affectionately called “Dr. Q” by her patients, strives to provide the best possible dental care to all of her patients. Over ten years as a practicing dentist has solidified her reputation in Monrovia and nearby areas. She is consistently named one of the best dentists in Monrovia, winning the 2012 and 2013 Beacon Media Readers’ Choice Award, 2013 Pasadena Magazine’s Top Dentist Award, and 2013 Pasadena star News’ Readers’ Choice. Dr. Q received her DMD from the University of the Philippines Dental School, graduating top of her class. Using a gentle patient-centered approach, Dr. Q’s technique merges procedural expertise with patient care and support for a holistic approach. Dr. Q is an actively participating member of the American Dental Association, California Dental Association, and Monrovia Chamber of Commerce. Everything from office decor and exam room furnishings to Dr. Q’s choice of words is selected to make patients feel at ease with any dental procedure. The latest technology and materials are incorporated to minimize discomfort and give patients, and their families, the best possible dental care. Dr. Q actively pursues continued dental education and encourages her staff to do the same to keep current with new procedures for increased patient comfort. Our office also follows all OSHA regulations and CDC guidelines. Member of the American Dental Association, California Dental Association, and Monrovia Chamber of Commerce. Specializing in: pediatric dentistry, periodontal maintenance, fillings, crowns, Invisalign, teeth whitening, and veneers. Community involvement in Boys and Girls Club, as volunteer dentist at Foothill Unity Center, and Huntington Hospital with the help of her trained therapy dog. Holistic approach emphasizing preventative care for long-term dental health and treating patients’ individual needs. What Can Dr. Q Do For You? 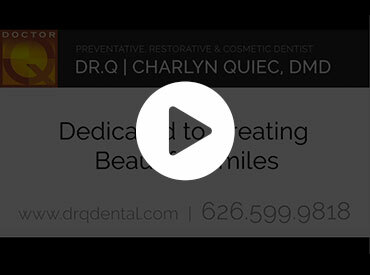 Dr. Charlyn Quiec is an expert cosmetic dentist. Sometimes, a once beautiful smile can suffer from damage or dental conditions. Sometimes, a patient has had dental issues for life and wants to finally have a better smile. Having a good smile is important to project confidence, joy, health, and beauty. For the patients of Monrovia who have to hide their smiles due to cosmetic dental issues, Dr. Q can help solve nearly any problem. In a consultation, patients can have a one-on-one conversation with Dr. Q to discover what types of issues they face, and what procedures can be utilized to address these issues. Patients who are curious about the possibilities of cosmetic dentistry should explore this website for possibilities, and call the office for a consultation today. Sometimes, patients suffer from issues that are not simply cosmetic. Sometimes these issues cannot be ignored. Pain and discomfort should not be written off, and if a patient is suffering when trying to eat or sleep, they may need emergency dental care. Monrovia patients should always seek emergency dental care if they experience any kind of major pain, if they suffer a broken or chipped tooth, a loosened or lost tooth, trauma to the jaw or mouth, or excessive bleeding in any part of the mouth. Dr. Q always treats each patient, regardless of their problems, with the utmost care and respect. Patients can be sure that they will receive prompt and professional dental treatment at Dr. Q’s office. She is even willing to work outside of normal hours to accommodate patients with immediate dental needs. After the procedure, care is taken to address any of the patient’s needs as they recover. Children are some of the most difficult patients to work with, but Dr. Q is an experienced pediatric dentist with a professional and warm attitude. Relating and performing procedures on children is a very different problem than adults. Dr. Q knows how to make dentistry a safe and painless procedure for children with her friendly and gentle attitude that puts children at ease. For people of Monrovia with children that need dental care, pediatric dentistry is all about starting early and keeping consistent maintenance. If a child is used to going to the dentist, they will often be less argumentative about future visits. Dr. Q helps children to build the good habits of dental hygiene that can prevent future dental disasters and ensure a healthy smile into adulthood and throughout their life. Parents should schedule their children early and often for routine dental work, and Dr. Q is the best bet for pediatric dental care. For all of those other issues that patients face, Dr. Q can handle it all. Preventative dentistry, wisdom teeth removal, fillings, crowns, and root canals are all part of maintaining a healthy smile. No one should have to suffer from a damaged smile or major dental issues. Dr. Q brings her professional and perfection-focused approach to general dentistry just like she does with more specialized procedures. 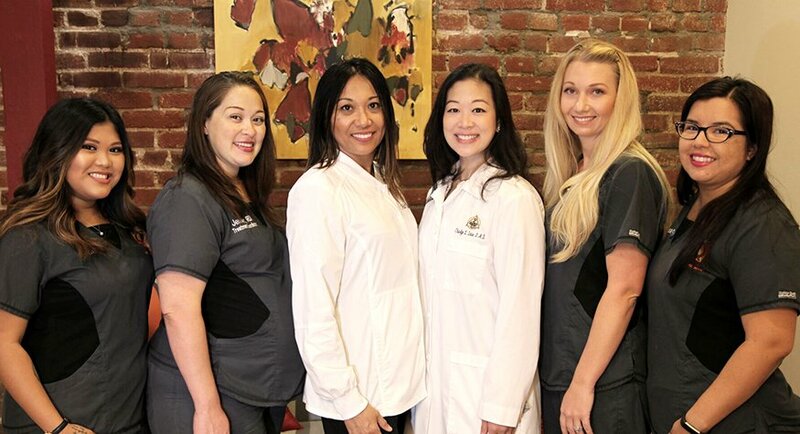 Through the use of advanced techniques such as the use of dental lasers, digital mapping, and high-grade materials, Dr. Q ensures that Monrovia patients who seek care at her practice receive state of the art care from a state of the art dentist. Whether it be a simple examination and cleaning, or deep periodontal surgery and complicated implants, patients can be sure that they are receiving the highest quality of care. Her reviews speak for themselves, patients are consistently impressed, and leave feeling happy and healthy. Contact her office in Monrovia at (626) 599-9819 today to schedule an appointment.